Christmas is a time of giving and one of the ways you can give back to your community is to shop local and support small businesses. When you shop local, you help contribute to your local economy and can reduce your carbon footprint. Plus it feels good to support local and when you do, a small business owner does a happy dance (true story). 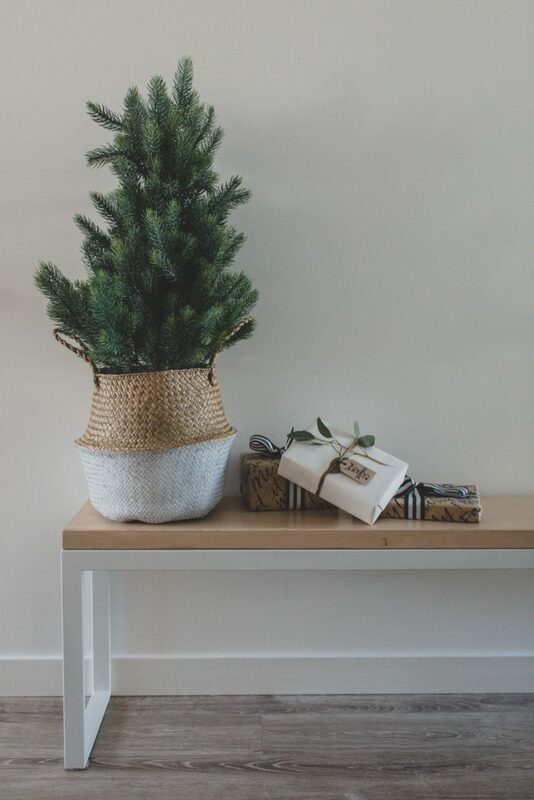 This Christmas I am excited to share with you a very special holiday gift guide curated by me! 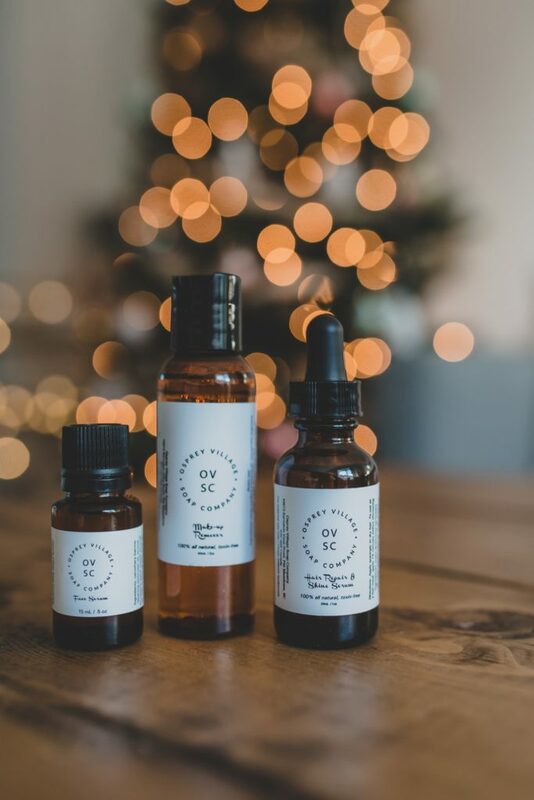 Each product has been hand selected from a small business that I admire and I hope to leave with you with some great gift ideas for shopping local this holiday season. A huge thank you goes to Jana from Wink Photography who captured this shoot beautifully. 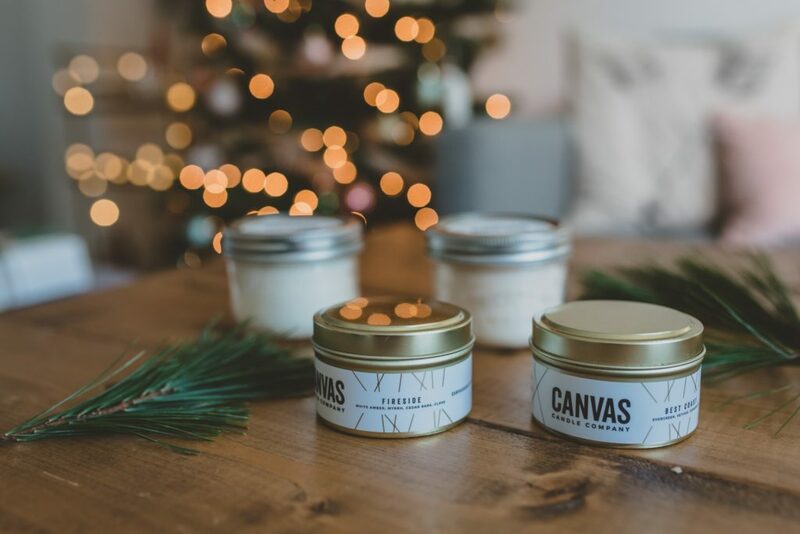 Canvas Candle Company is located in Port Moody and was born out of the need for a clean and safe burning home decor accessory. They are proud to provide high quality, 100% soy candles that are hand-poured locally with natural and non toxic fragrance oils and essential oils. My favourite holiday scent is Best Coast! You can purchase these products online or visit Canvas Candle Company at one of their stockists or upcoming markets. Elena Markelova is Russian-born artist now living in beautiful Vancouver, BC. She finds inspiration for her artwork in the beauty of city and nature, the power of the ocean and the enchanted life of the creatures that inhabit her new home. And best of all, she is my neighbour (seriously)! How’s that for shopping local? You can check out her booth at these upcoming markets. Pink River proudly makes handmade eclectic accessories with globally sourced and ethically made materials. This basket is perfect for holding items like plants and blankets and it serves as a stylish storage solution for things like toys and games. For more info, visit Pink River on Instagram. Cabin + Cub specializes in laser cut wood fashion accessories and homeware. 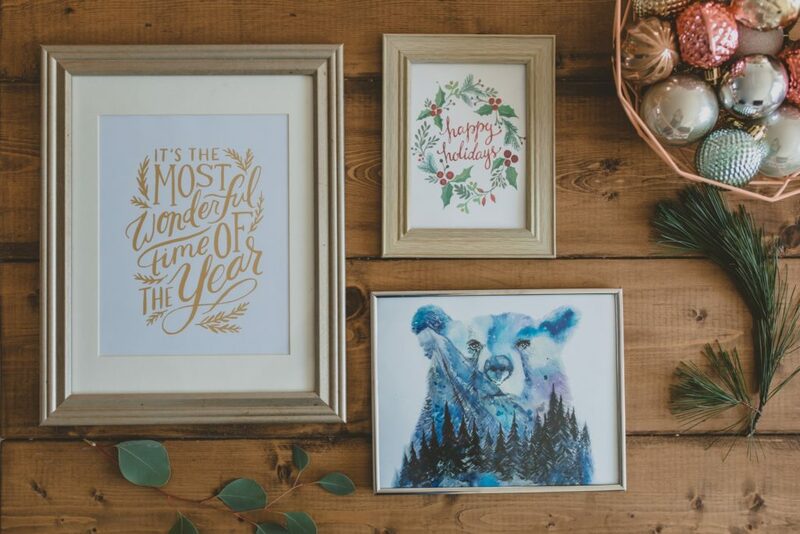 Their designs are inspired by Canadian landscapes and wildlife and her products are designed in-house, cut in North America and lovingly assembled by hand in small batches. 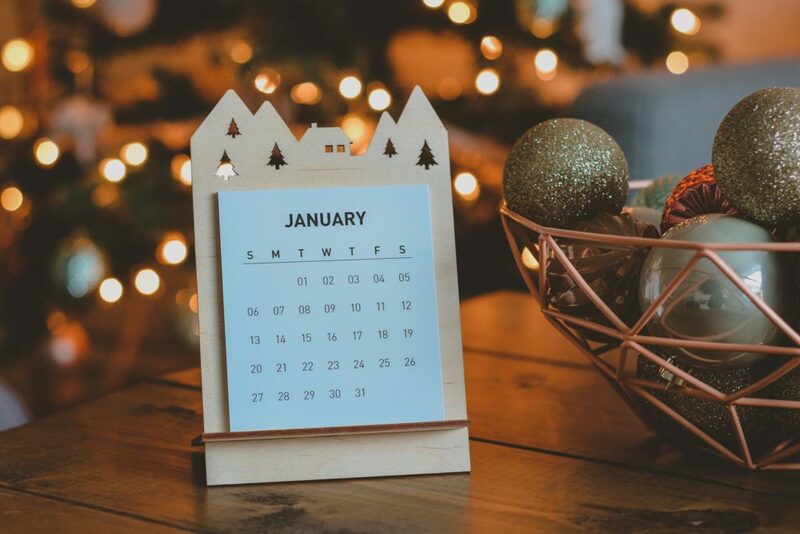 This mountain cabin desk calendar is both pretty and practical! Check out Cabin + Cub on Etsy or visit their booth at these upcoming markets. EMSAY Studio creates the most unique industrial raw concrete pieces including furniture, accessories, planters, and home decor. Each piece is handmade in Railtown’s Octopus Studios in Vancouver BC and is 100% handmade. I love the minimalist and modern style of their designs! You can purchase these pieces online or visit EMSAY studio at one of these upcoming markets. 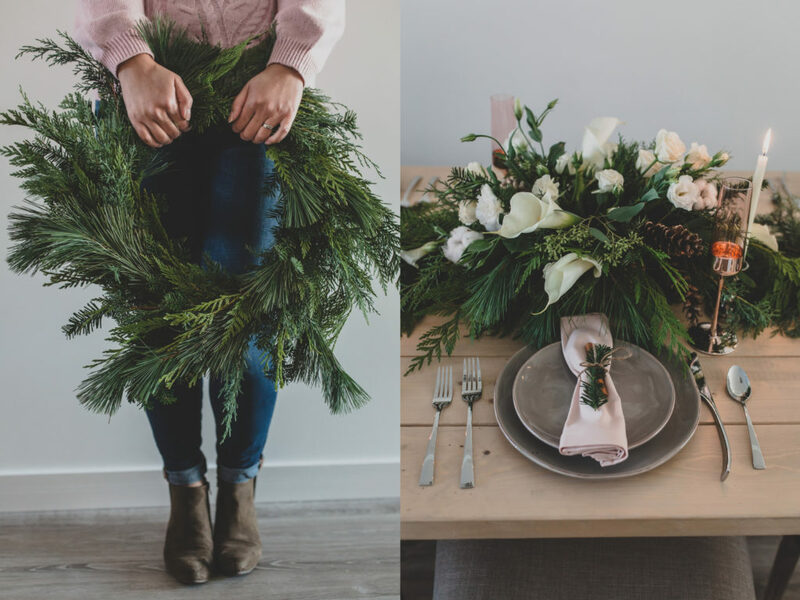 Bridal Beginnings – Floral & Event Design creates beautiful fresh floral arrangements, garlands and wreaths which are perfect for sprucing up your home for the holidays! This festive wreath made of cypress, cedar, pine and fir is long lasting and looks great on any front door. Visit Bridal Beginnings on Instagram if you’d like to place a holiday order! Osprey Village Soap Company creates high-quality handcrafted skin care items that are completely toxin & chemical free. They make everything from makeup remover to beard oil! You can feel good about using these products because they are natural with no harmful fillers. You can purchase these products online or at one of their stockists in the lower mainland. Poco Soap Co is an all-natural soap company based in Port Coquitlam. They are dedicated to the goal of not using any plastic packaging in any of their products and all their labels are made from sugar cane waste fiber which is both biodegradable and compostable! Every bar is made with organic coconut oil, pure extra virgin olive oil, organic shea butter and avocado oil. Their beer bar is made using beer from a local brewery Northpaw Brew Co (which is just down the street from me). You can visit their website for more info or visit their booth at one of these upcoming markets. Not only are these Haven + Ohlee scrunchies beautiful but they are gentle on your hair and help prevent breakage which is why I love them! These luxurious scrunchies are made with high quality organic fabrics and are ethically made in Vancouver BC. 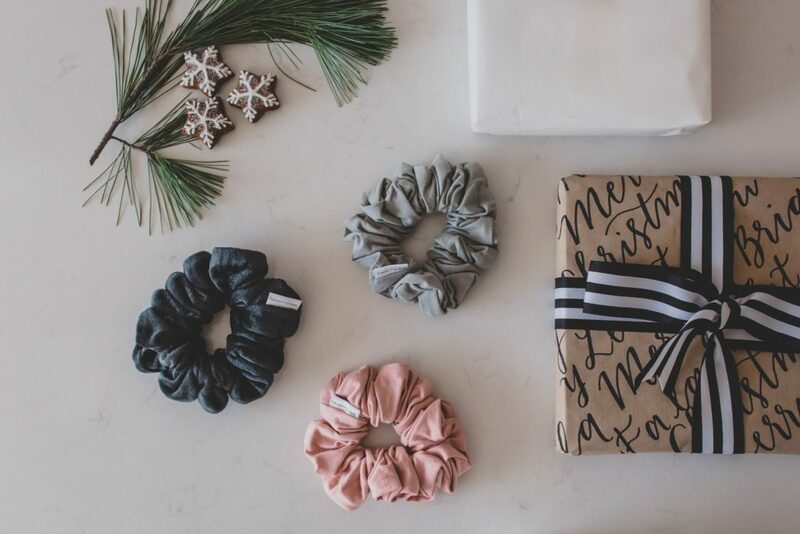 You can grab your own scrunchies online or visit Haven + Ohlee at one of their upcoming markets. 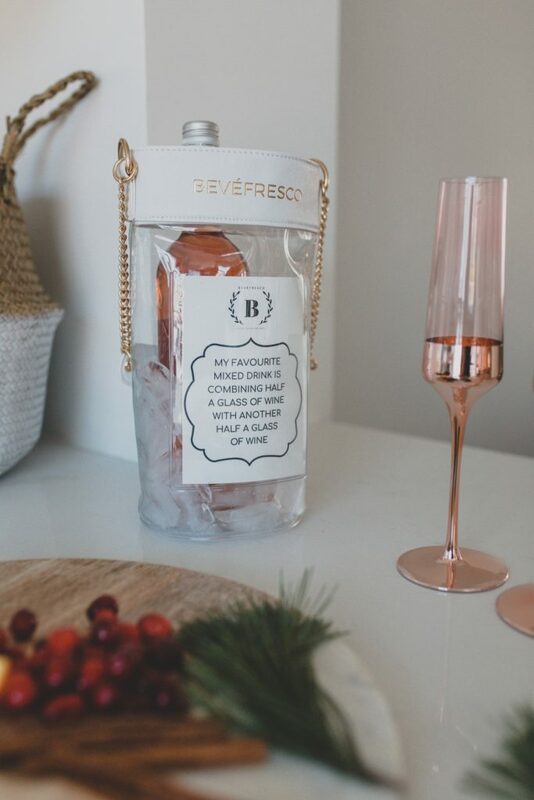 This Luxe Beverage Chilling Bag from Bevéfresco keeps your wine and other beverages cool and classy! The see-through design and lightweight portability makes it the perfect party accessory. With a pocket that fits a photograph, greeting card, or customized message, this Bevéfresco bag makes a great hostess gift this holiday season. All you have to do is add some ice and water! 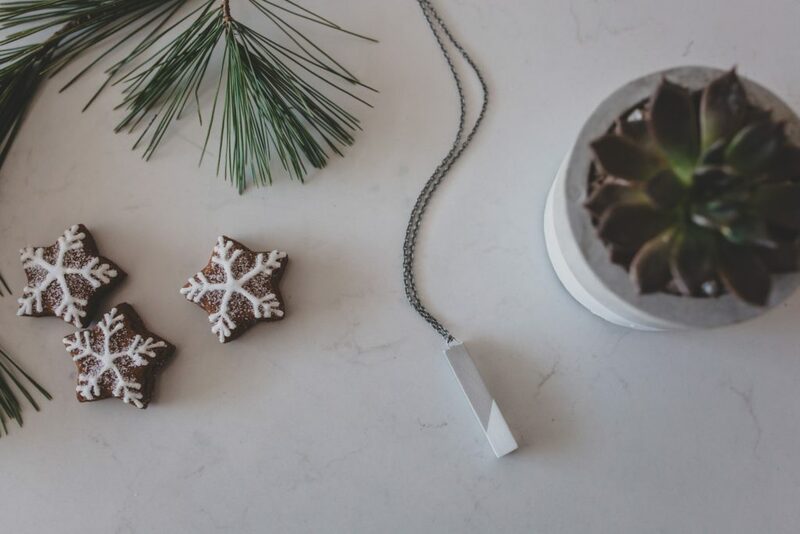 White Fox Collective is a jewelry and accessory company based in Maple Ridge, BC. All of their products are lead and nickel free which makes them great for sensitive skin. 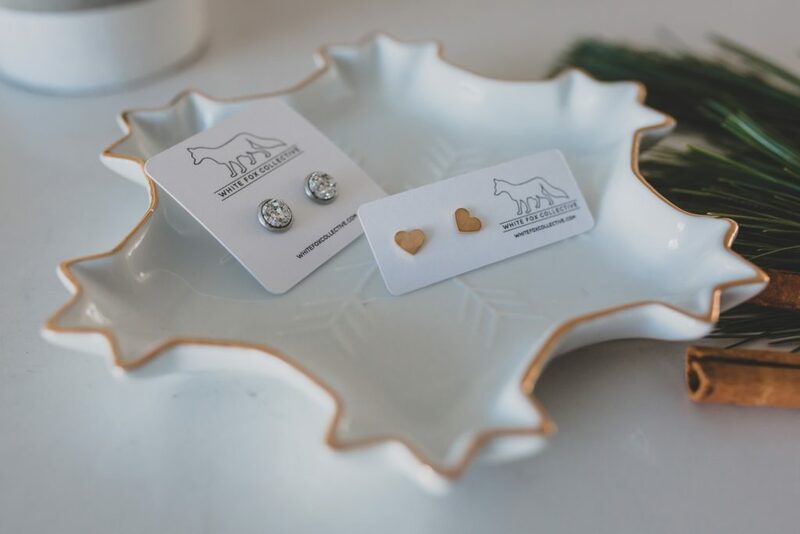 Their faux druzy earrings are perfect for the holiday season! 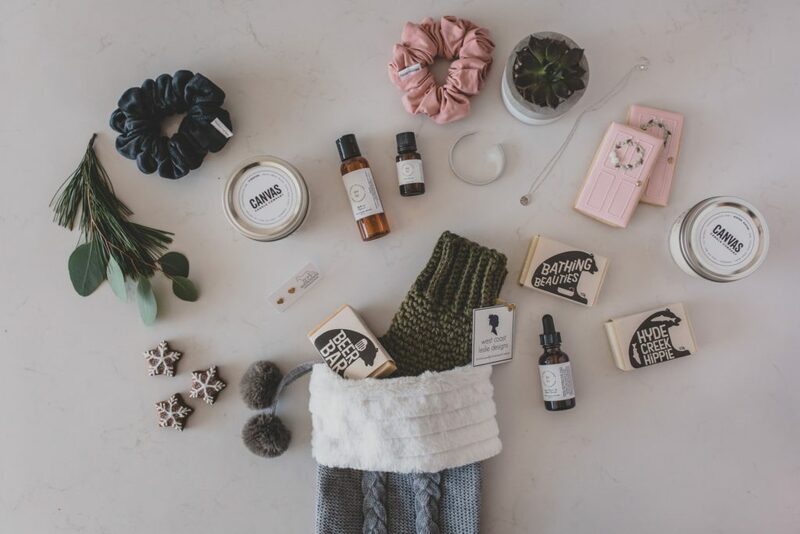 You can shop these items and more online or at these upcoming markets. West Coast Leslie Designs is a heritage inspired, heirloom-quality knitwear brand for modern women and their home. Leslie makes everything from blankets to toques to pillows. 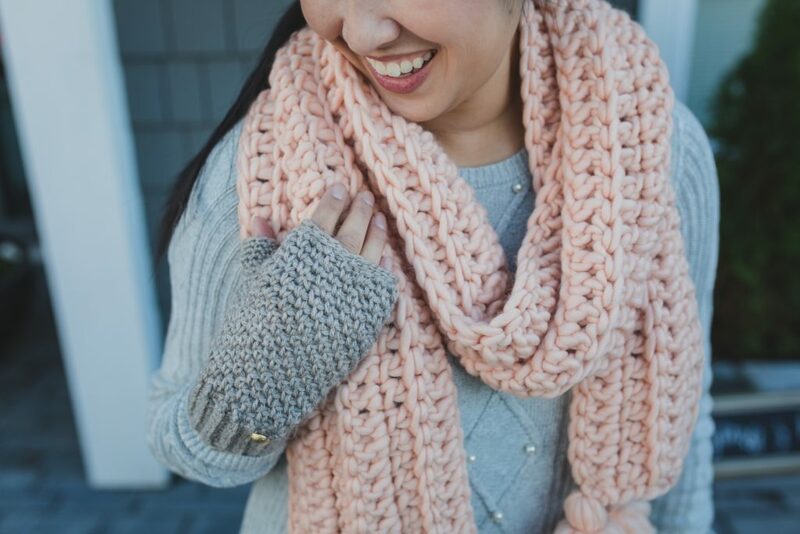 Her textured accessories are easy to wear and they feel so cozy too! For more info, visit West Coast Leslie online or check out her booth at the Bloom Winter Market on November 24th and 25th in Fort Langley. Courtney Rai Dawn Jewelry specializes in personalized and hand stamped jewelry. Her designs are timeless, elegant, and versatile and each piece is created by hand in her home studio in Maple Ridge. I especially love her YVR Collection featuring the Vancouver city skyline which includes Science World, the downtown core and our beautiful mountain and forest views. 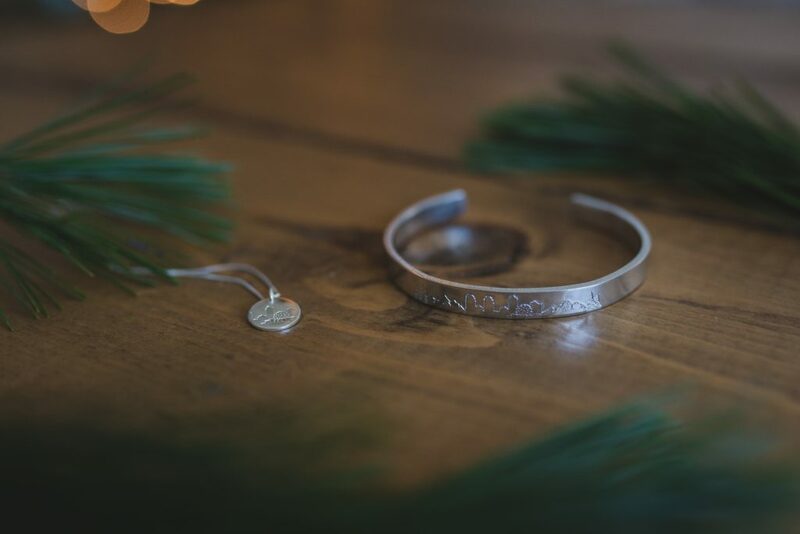 This dainty necklace and cuff are hand-cut and and stamped out of sterling silver and are also available in 14k gold fill or rose gold fill. You can check out more of her designs on Instagram or visit her at one of these upcoming markets. 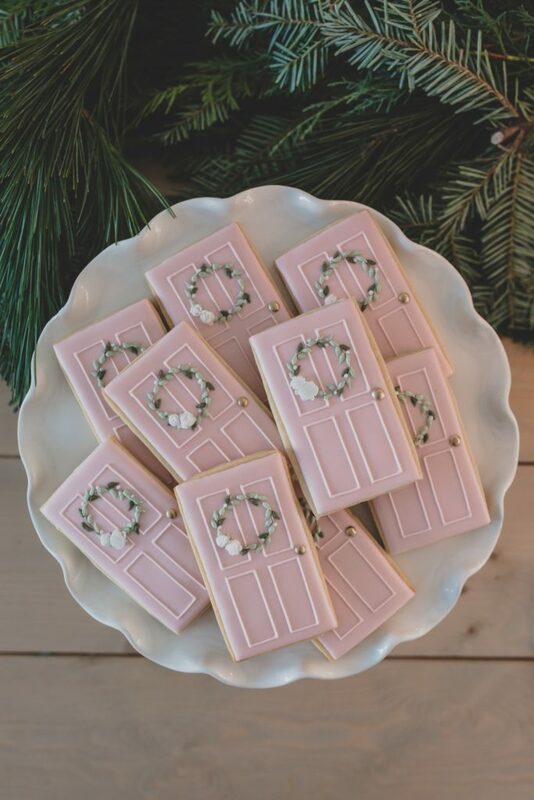 I have had the pleasure of working with Leah of Sugar Coma Cookie Co on many styled shoots and she never disappoints! 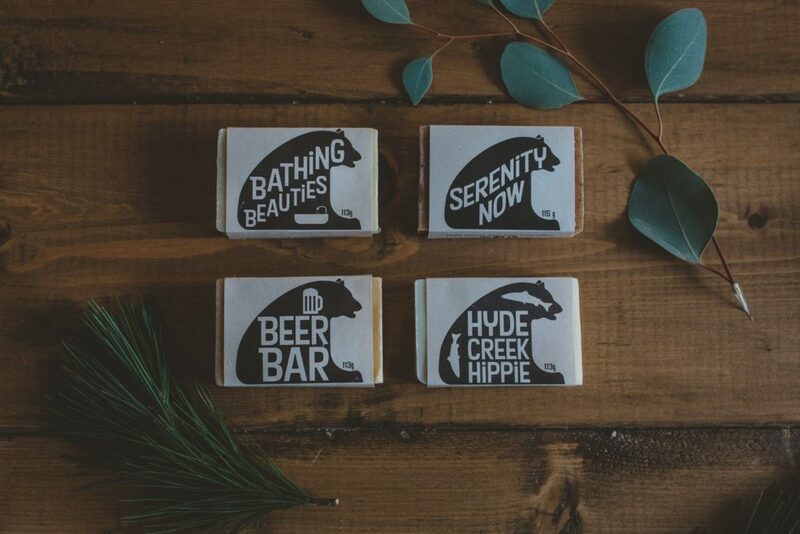 She makes the most beautiful hand crafted sugar cookies for the lower mainland. You can grab some of her creations at the Tri-Cities Collective Christmas Market on November 18th in Port Moody. 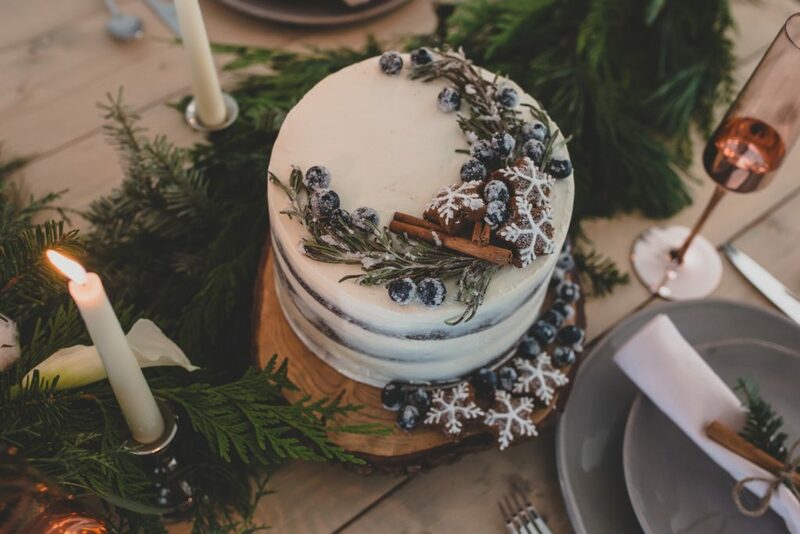 Meagan McLean is the owner of Little Acres Home Bakery and she made us this beautiful naked cake. 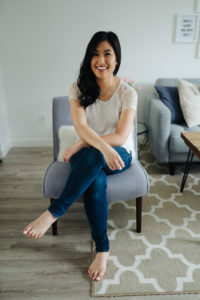 Her bakeshop is located on her childhood family farm in Abbotsford and she prides herself on using quality ingredients and baking her products as fresh as possible. Check out her Instagram for more of her work and stay tuned for her holiday cookie presale! Kaylie at Braidbooth is an experienced braid-artist and makeup artist. She is available for special events, weddings and braid parties for on site hair services. 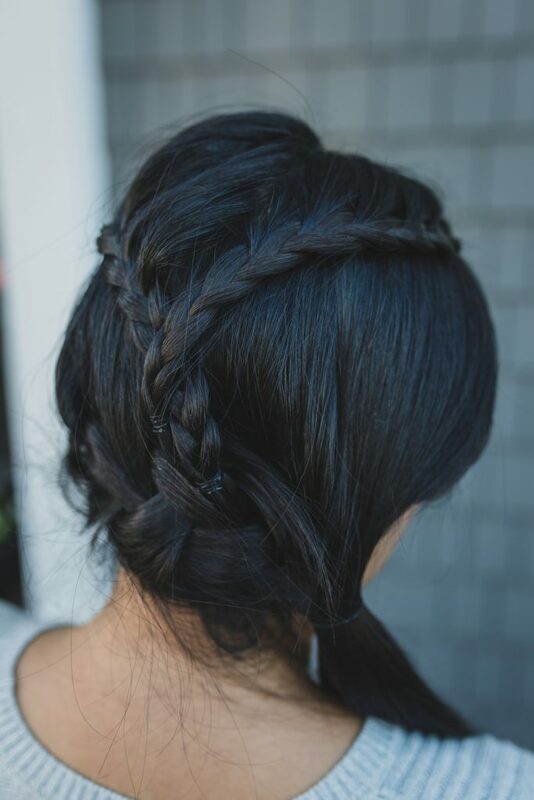 You can hire Kaylie to do braid styles for everyone at your next holiday party or she can even host workshops where she teaches everyone to braid! She also provides gift certificates so you can gift her services to someone on your list. Hand Lettered Love by Bev (hey that’s me!) 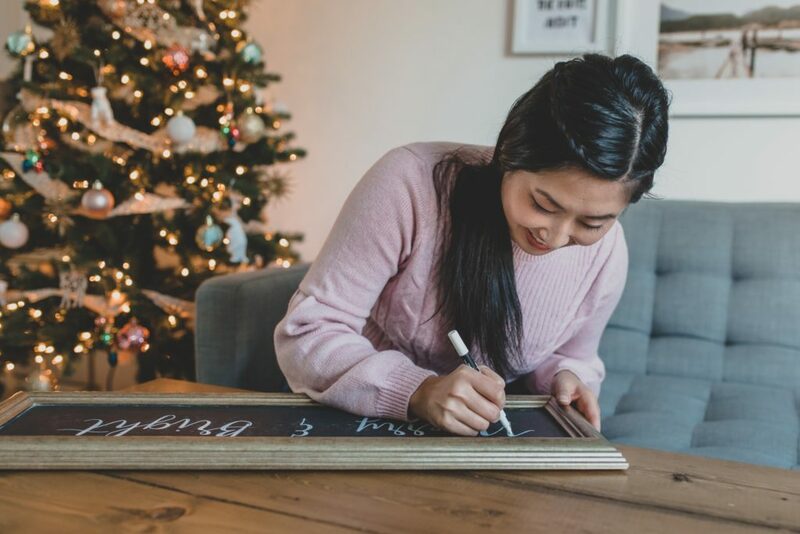 offers beginner calligraphy workshops for those people on your list who have everything. My next workshop is Sunday January 20th 2019 at High Street in Abbotsford. Digital gift certificates are available upon request! For more details and to register, click here.